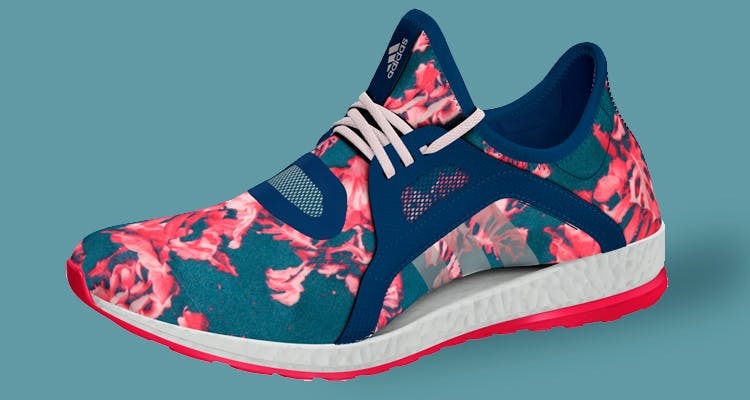 Blending style, comfort and high-fashion, PureBoost X by adidas hits the shelves today, and it’s only for you ladies! Womenfolk, remember how we always used to look into a sports store and walk past the walls and walls of shoes for MEN. That has changed in the past few years and adidas makes it even better with the launch of the tremendously futurist running shoes, created solely for the female athlete. So say hello to your new BFF, The PureBOOST X. Made after testing it on sportswomen across the globe, this pair of beauties is sleek, light and your foot will feel like it’s gliding on air, thanks to the foam capsules (BOOST) that form the soles. Throw in a slim line of stretch mesh mid-foot as well as on the entire upper and you’ve got added flexibility in every step. As much as we love our heels and boots, when it comes to training, all we want is a fit that lets us get as much natural motion, right ladies? Especially in raw purple and shock red, black and shock green, and mineral blue and halo pink. That said, we’ll never say no to even our trainers being high fashion. So of course, Stella McCartney versions feature her signature geometric prints as the primeknit upper with extended lacing details. Why not get fit and look darn good doing so, no? And since we’re telling you about this, feel free to buy us a pair, each. We’re an all-girl team, you see! Find your nearest adidas store here.